On Friday evening, the Friends of Hemingfield Colliery were privileged to be present at the unveiling of the restored Newcomen beam engine at Elsecar. The engine – a Scheduled Ancient Monument, No. SY1146, since June 1972 – is the only atmospheric engine in the world still in situ; still working in its original building and over the original mine shaft. Built in 1795 as the Dearne and Dove canal drew nearer, and the 4th Earl Fitzwilliam’s Elsecar collieries and industrial enterprises were being expanded, the engine has pumped billions of gallons of mine water during its working life – a run which officially ended in 1923 when electric pumps were installed by the the South Yorkshire Pumping Association – the same body that maintained the pumping stations at Hemingfield and over at Westfield in Rawmarsh. Finally when preparing for a visit in 1953 an accident damaged the cylinder and put it out of action, though the engine remained in the care of the National Coal Board until 1988 when it was purchased by Barnsley Metropolitan Borough Council together with the Elsecar workshops. In 2010 the engine was listed on English Heritage’s regional ‘Heritage At Risk’ register. The following year the Barnsley Museum and Heritage Service succeeded in securing development funding of £40,500 from the Heritage Lottery Fund. It has now undergone extensive restoration work under the 2-year Industry and Innovation: The Newcomen Engine at Elsecar project at Elsecar Heritage Centre. The project included not just the engine, but the also the sandstone engine house and the pumping shaft which the engine worked as well as the connection to the workshops and the wider village. Works undertaken included repairs, renewals, restoration, paint work, resurfacing, hydraulic systems, lighting, and interpretation, alongside community engagement, educational and volunteering schemes. During the process investigations into the site included archaeological work and submersible camera and diver surveys of the 110ft deep pumping shaft. All of this was enabled by £425,000 of Heritage Lottery Fund support together with a further £60,000 from English Heritage. The restored Newcomen-type beam engine now runs by means of a hydraulic ram which permits the working of the beam, together with the motion of the cylinder piston and pump rods to be seen in action. This careful – but dynamic – approach was adopted to retain and preserve the original ironwork, rather than leaving the engine as a static display, but without needing to replace large amounts of its historic structure which would have been required to work the engine with a boiler under atmospheric pressure to modern standards. Friday night, then, was the culmination of a lot of hard work by a large number of people over the past couple of years. The evening was somewhat wet, but the old Elsecar ironworks buildings kept us dry and provided the perfect venue to listen to the programme of speeches and short videos, accompanied by the first glimpse of a whole series of new interpretation boards recounting the history of Elsecar, its people, industries and buildings. Afterwards, the crowd headed outside to watch the grand unveiling and activation of the Newcomen engine; a countdown setting it in operation against a flurry of fireworks and the whistle of a steam engine from Elsecar Heritage Railway. The Mayor of Barnsley addresses the attendees. The proceedings began at 5.15 pm, led by Lynn Dunning, Arts, Museums and Archives Manager at Barnsley who introduced the Mayor of Barnsley, Councillor Tim Shepherd. Representatives from English Heritage and Sheffield Industrial Museums Trust Ltd addressed the gathering, all keen to emphasise the importance of this project; the world-wide significance of the Newcomen-type engine, and the wider village of Elsecar. Kelham Island Museum Chief Executive John Hampshere who had supported the initial Heritage Lottery Fund bid and joined the project also jokingly conceded that whereas Kelham Island has the most powerful working steam engine in Europe in the River Don Engine, he would have to admit that Elsecar had the greater prize in their Newcomen engine. Mr Hampshere also put down a marker for the future – insisting the Elsecar site was ripe for further investigation – particularly the likely buried remains of the enormous ironworks under the hill behind the railway…there’s still plenty more to be found! “Newcomen’s Atmospheric Engine” the black-and-white Shell Film Unit (Cinemagazine No.20) piece – which features footage of the Newcomen Engine in action from October 1951. The keynote speech was delivered by Geoff Wallis, Lead Project Engineer in the restoration and current President of the Newcomen Society – the International Society for the Study of the History of Engineering and Technology. Geoff was passionate about the project, an enthusiasm shared by a whole generation of industrial archaeologists and engineers. As President of the Newcomen Society, he also read out a message of congratulations from the Patron, HRH Duke of Gloucester. Describing the origins and development of Newcomen’s great invention, but noting the usual fate of industrial machinery, Mr Wallis made clear how fortunate we are that the engine has survived to this day. Paying tribute to the Project Team and partners, he referred to the dedication and enthusiasm shown by a range of specialist contractors, architects and craftsmen; in particular Purcell, William Anelay Ltd, and Lost Art. He also paid tribute to the Barnsley team – Lynn Dunning and Dr John Tanner and presented them with a gift to record their involvement – a small section of wrought iron, taken from the engine’s pumping gear which he had cut and mounted. At 6.30pm, after the Mayor had switched on the Christmas lights, it was time for the activation of the Newcomen engine. The Mayor, together with former NCB mining engineer and Newcomen enthusiast Peter Clayton did the honours. Peter has worked on and raised awareness of the engine from the 1960s onwards. With the kind permission of Dr John Tanner, Barnsley’s Museum and Heritage Project Manager, the Friends were able to mount a display in the ironworks about Hemingfield colliery and its future. 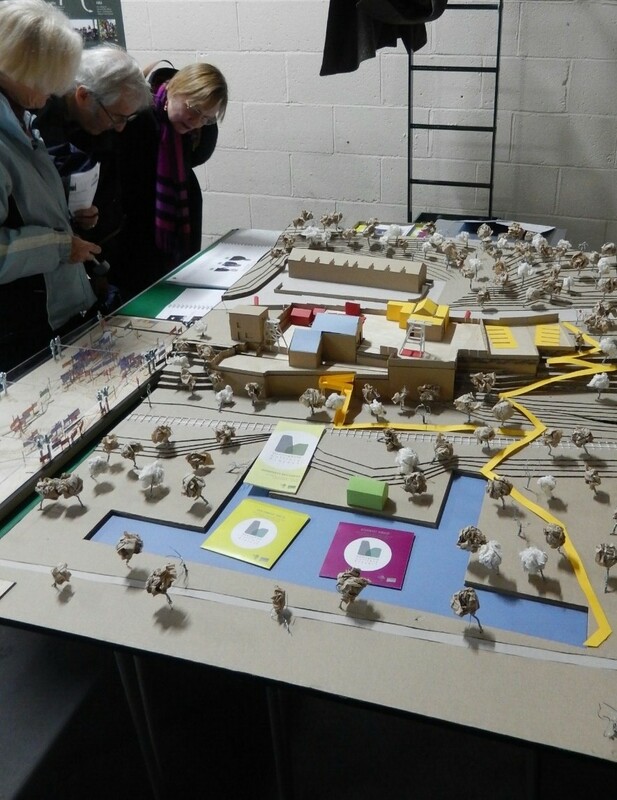 Using the model and support materials produced by the SSoA Live Project team, the Friends introduced the site and our plans for its development to a new audience and were greatly encouraged by the interest and positive feedback received from those attending the event. The Friends were pleased to meet all those who attended, and the group made a number of new contacts, including industrial archaeologists and enthusiasts from as near as Sheffield and as far as Surrey. The Friends were also supported by a student representative from the University of Sheffield’s School of Architecture Live Project team. We hope to stay in touch and have many interesting developments to report, following on from the detailed guidance, design ideas and funding proposals they have developed. – All-in-all a most memorable and delightful evening was had by all! ← [Live Project] It’s not the end, but just the beginning!